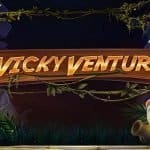 Wild Worlds is NetEnt based video slot machine that is playable across every single devices including mobile and tablets. This is 5 rows and Cluster (Payline) based slot game that pays you a maximum of 2500 times of your stake. 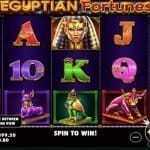 You can play this slot using NetEnt online casino with coin sizes of 20p per spin to up to €£400 per spin. RTP for Wild Worlds slot game stands 96.47%. 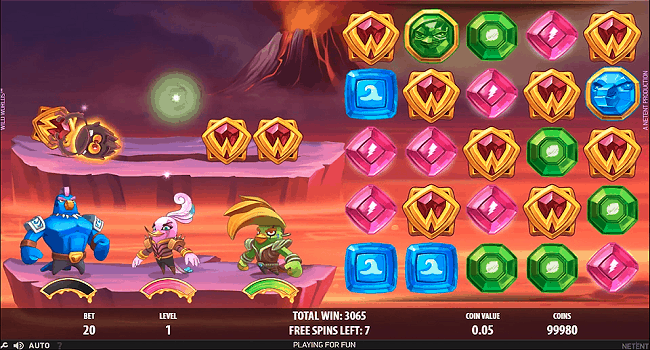 Wild Worlds slot is inspired by superhero comic books. This game comes in with an Avalanche feature (the feature in which 3 matching symbols of a winning combination will be replaced with new symbols to form more winning combinations). 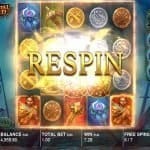 There are plenty of features available in this game including the free spin bonus feature. This is an awesome online slot game that has a very bright and coloured playing arena. Initially you will see there are 2 parts on the screen of yours. The first part of the screen features 3 different superheroes (in a command centre) and from there their duty is to save the world from any misadventure from giant monsters. While the second half of the screen contains reels of the game. You will see many low paying as well as some high paying symbols on the reels. Some of the symbols are green, purple and blue gems, while the world ‘w’ as a gen itself is the wild symbol which pays you 100 times of your stake if you land 5 of these across your Payline. During the base game, this Destroy Feature might activate after a dead spin (in which symbols of only 1 colour get will be remained and rest will be removed except the scatter). This will increase your chances of winning by forming winning combinations. Plus, landing winning combinations that includes Hero symbol during base game will transform others in to wilds and that feature would be known as Hero Wilds feature. Free spin feature- land 3 or more scatters anywhere in the reels and you would receive 8 free spins along with the bonus that comes in with 3 levels. These 3 bonus levels are as follows. Dark Forest – This bonus feature comes in to play when a weak spot monster is destroyed and then the Spreading Wilds will be placed on the reels. Ice World – 2 Heavy Wild symbols will be added to the reels during this feature when a weak monster is destroyed during base game. Fire Lands- 2 to 4 wilds will be added randomly for a monster destroyed.